Spring is the perfect time for dresses. Between the sunny days, vacations, and the numerous invitations to brunches, weddings, bridal showers and baby showers, I always find myself in need of dresses for these occasions. One of my go to places to find dresses is at Neiman Marcus at Fashion Island. Not only do they have an amazing selection from designer brands to trendier brands at Cusp, they also have such knowledgable stylists on hand to help find the perfect look for every event. Since my brother in law is getting married in April, I definitely need a dress to celebrate his nuptials. We literally have been waiting for him to get married after being with the same girl for over 10 years so to say it is a big deal for the entire family is quite an understatement. That being said, I need a show stopping dress (yet not too formal) for all the family photos and celebrations that will be going on. This dress by Caroline Constas is the perfect option for an informal wedding (aka not black tie). The sheer layers of ruffles with the metallic print against cool shades of blue and grey makes this spring dress edgy but also light and feminine for a wedding. I also love the hint of sparkle in the details of the dress which makes it more fabulous for an evening wedding. 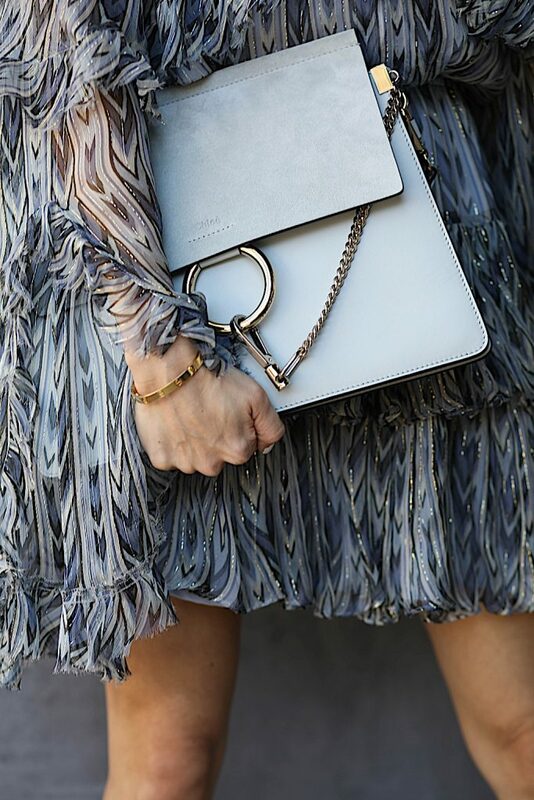 In keeping with the monochrome look (which I’ve been obsessed with lately), this Chloe bag complements the dress well without taking center stage. I also love these fun Christian Louboutin heels that has the perfect amount of blues and greens to complement the dress. What’s perfect about this dress too is that while it can be worn for a wedding, I can easily wear it to brunch or in the summer with some sandals or sneakers to dress down the look. In addition to the upcoming wedding, I also have a baby shower to attend for a good friend who recently got married and literally got pregnant on her honeymoon. It will be a reunion of sorts so I definitely want to look my best in a spring, floral dress. I fell in love with this Veronica Beard print as soon as I saw it. While I am not usually a pink person, the mix with whites and black on this dress along with the unexpected ruching had me giddy to try this on. It fits so well and the ruching is adjustable so you can tighten it as much as you want or let if flow longer. I also appreciate the open front so that you can show off some leg. This is perfect for a more petite frame as well so create the illusion of longer legs. To highlight the pink in the dress, I chose these fun Valentino heels and these statement earrings from Oscar de la Renta. I just love the pink and red combo in the earrings and they add that extra statement to the more conservative style of the dress. Whether you are looking for dresses for Spring break or summer vacation plans, or for specific events going on, you have to check out Neiman Marcus for their myriad of options. Here are some of my favorite looks for every occasion from the store. Yay to Spring and the events it comes with! Congratulations to your brother in law! Both looks will be perfect for a wedding! I love the sleeves of your first look! They are so fun and the print is tdf! I clearly remember the detailed shot from your Instagram and have been dying to see the full outfit! The Second for me a bit more Classy but Love it. I love that off the shoulder dress! 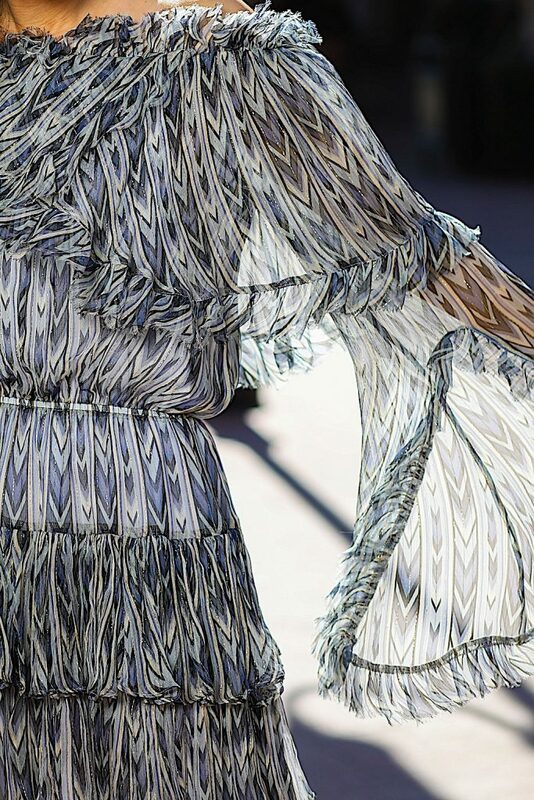 The metallic thread running through it is just the perfect finishing touch. Wow, dating for ten years, that will be a big celebration! They would have been through so much together! Wow this dress is just stunning on you! You will be the best at that celebration! I was very much longing for spring to wear lighter clothing, especially dresses. You look gorgeous in both dresses Christine, the styling is superb! Both versions can be worn to any occasion, I love the versatility. Ahhh loving both of them! The prints are so gorgeous and they look so lovely on you! The first dress is absolutely stunning! I actually have a wedding to attend at the end of the month so this post came at a perfect timing! I have to admit that I like the first dress. You look gorgeous. The first dress is so bold and you look amazing in it! Neiman Marcus is the best! You look so gorgeous in both of these dresses girl!! Love how you style them! Need to stop by NM because I always have so many events during Summer and I know I’ll have a couple weddings! Yes! NM is such a great go-to for looks. I am a huge fan of Nordstroms and Bloomies, because I love there assortment of styles and aesthetics. I am in love with the patterned dress you featured, and the Chloe bad was the perfect touch. You look fabulous on that dress dear. Such an adorable print. The bag is perfect for your outfit too. wow you look amazing in both looks!! I love how light & airy both of these dresses are, making them perfect for spring! Also, perfect selection of bags and heels for each! I can’t wait to wear a pretty spring dress myself once it gets a little warmer! Both dresses look absolutely stunning on you Christine! The Caroline Constas dress is a show stopping dress with your signature look of edgy; the Veronica Beard print dress is so elegant and classy. Love all the picks that you recommend. I am going to attend a friend’s son’s wedding in April in Mexico, I will definitely take a look of the collection at NeiMan Marcus. I love both dresses but the first is for me the best 😉 love the print looking like a bird wings . Absolutely awesome and looking perfect on you. Congrats for your bro! Both of the dresses looked exquisite and lovely in their own ways. One is a casual chic look and the other is a nice evening out. I love both! The Caroline Constas dress looked so dreamy and the golden threads woven into the fabric looks luxe and like a wing of a bird! Very dramatic! I’m so in love with that all white Valentino rockstud clutch…NEED IT for spring! Neiman seriously have the best dresses for every occasion and every style, now I want to get dolled up even though I have no where special to go to. Wish we had Neiman Marcus in Vancouver. I shopped in there last year when I was in California and bought a pair of heels of course. Since you are ready for your brother-in-law wedding maybe you should come to my wedding in Italy after 🙂 I love the dress on you paired with that Chloe bag. It’s feminine and so perfect for a Spring wedding. I adore you when you wear dresses. You sure picked the perfect outfits for both occasions. That Valentino Rockstud looks amazing with the second dress, classy and fabulous. I am looking forward to seeing your pictures on Instagram! Have a great time in both parties! You look amazing in that dress ! Adorable print ! Those dresses really suit you. You look amazing. Loving your pictures. Wow! You are so gorgeous! I’m inspired by your looks! These prints on your dresses are just adorable! The best choice for the summer and the spring! Omg I feel ya! As soon as March hit, there are so many wedding, bridal, brunch and dinner events! I am having to go to the mall every week! I don’t go to Fashion Island often, just because it is so far, but I always find the best outfits there! I really love both dresses you picked up! The Caroline Constas dress is perfect for an informal wedding! Girl, you look stunning! Yaay, we are a few days apart from Spring and your looks are a great source of inspiration, both are so pretty. First one is my favorite and I loved the way you styled it. I will definitely stop by Neiman Marcus to complement my spring wardrobe. I am not the biggest fan of pink either, but I am loving your dress choices! I normally don’t wear them too often, but I agree that both of these are options that can carry you from season to season. Your selected jewelry goes so well with them too! You are just so fabulous!!!! Everything looks so good on you… and you style it so perfectly. You continue to be one of my favorite bloggers to follow for your unique and refreshing spin on trends and fast fashion!! Thankyou for sharing! You look so classy and gorgeous! Oh my gosh these two dresses are just GORGEOUS!!! I especially love the first one. Totally want them both though!! Where do you find all of this outfit idea?! Omg I’m literally obsessed with your outfit. A very chic style, A very good choice!